The True North Youth Foundation (TNYF) will launch its Away Game 50/50 Program today, allowing fans in Manitoba to purchase 50/50 tickets for today’s Winnipeg Jets at Pittsburgh Penguins away game, and for all other away games this season, in support of TNYF and its youth-centred programs. “The 50/50 program has become a staple in our home game atmosphere and now we can generate the same excitement for Winnipeg Jets away games while also supporting the work of the True North Youth Foundation,” said Dwayne Green, the foundation’s executive director. The draws will open at noon CT on each away game day and will close at 9:30 p.m. CT that evening, regardless of game time. For tonight’s 6:00 p.m. CT game in Pittsburgh, fans will be able to purchase their 50/50 tickets beginning at 12:00 p.m. CT until 9:30 p.m. CT. Fans can purchase their 50/50 tickets safely and securely online at www.tnyf.ca/fiftyfifty. Tickets will be sold 1 for $5, 3 for $10, 10 for $20, or 50 for $50. Once visitors are on the webpage, there will be prompts to complete the transaction. As per LGA 50/50 regulations, purchases can only be made from IP addresses that are within the province of Manitoba. The draw will take place at 11:30 p.m. CT on the day of each game, regardless of the game’s finish time, and the winner will be contacted the next business day. To see the Winnipeg Jets away game schedule, please visit www.winnipegjets.com/schedule. Established in 1996 as the Manitoba Moose Yearling Foundation, the TNYF is the charitable entity of True North Sports + Entertainment and of the Winnipeg Jets Hockey Club. TNYF is relentless in pursuing its vision of empowering potential in youth by administering meaningful programs that enrich physical, social, mental and emotional aspects of a child’s life. 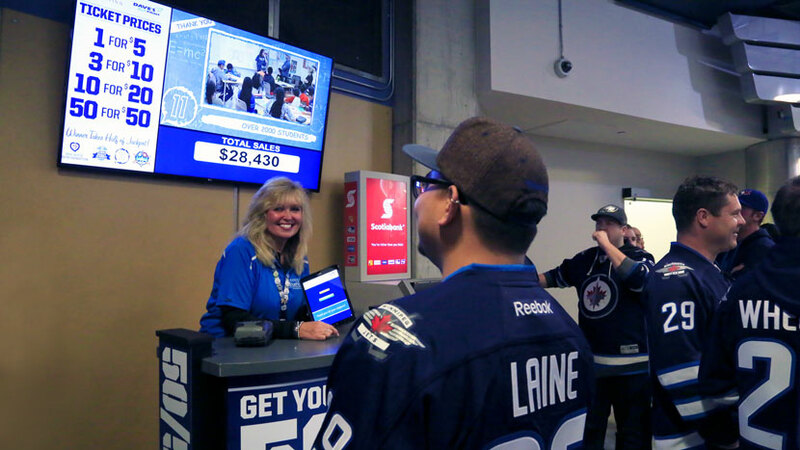 Over the past five seasons, the Winnipeg Jets Hockey Academy, Camp Manitou, and Project 11 have benefited from just under $7 million raised through the Kromar Printing 50/50 at Winnipeg Jets home games and Dave’s Quick Print 50/50 at Manitoba Moose home games. Last year, more than 18,000 Manitoba youth benefited from the foundation’s programs. For more information on the True North Youth Foundation, its programs and events, or to make a donation, visit www.tnyf.ca.